It's been awhile since I geeked out on here, so this is for my tailoring readers. 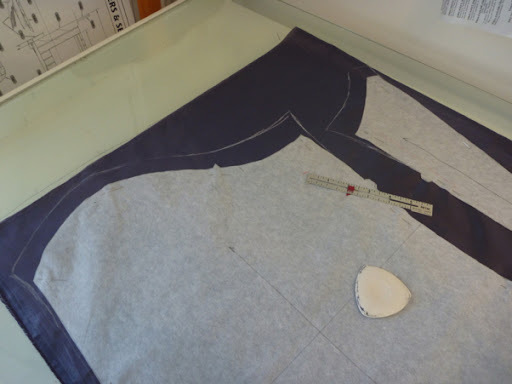 Using the sleeve and undersleeve patterns, I cut on about an extra inch at the top, flaring to maybe an inch and a half at the underarm edge. This helps prevent ripout of the lining at the armpit. I just freehand it with chalk. 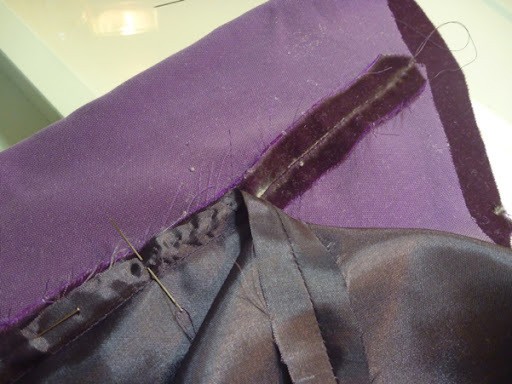 The lining armscye seam will have to be hand sewn to the body of the lining as the jacket nears completion. This gives me plenty of extra material to work with when that time comes; a case where a little extra fabric is way better than too little. 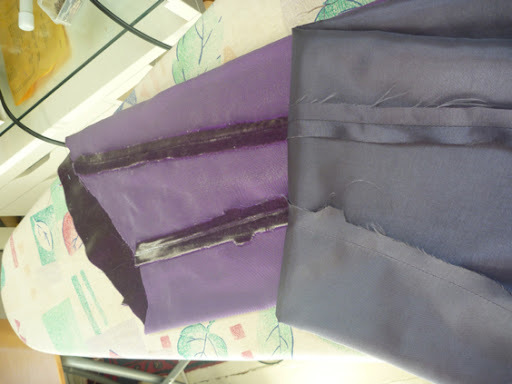 I've also add 1/8" to the sleeve sides for wearing ease. The next steps are from the Cabrera book on menswear tailoring. A little bit of tailoring wizardry for those of you who, like me, love this stuff. 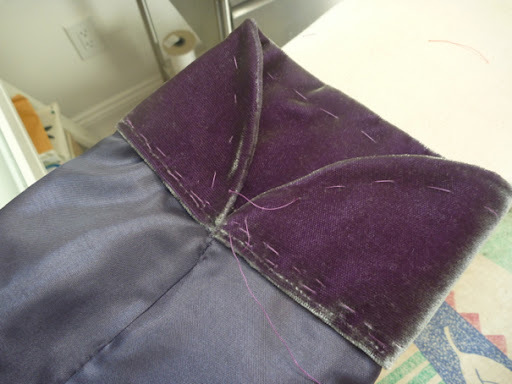 Start by turning both the sleeve and lining wrong side out and place the lining on top of the sleeve so that the seams align. Starting about 4" from the top of the sleeve, attach the lining sleeve allowance to the sleeve seam allowance with a diagonal stitch. 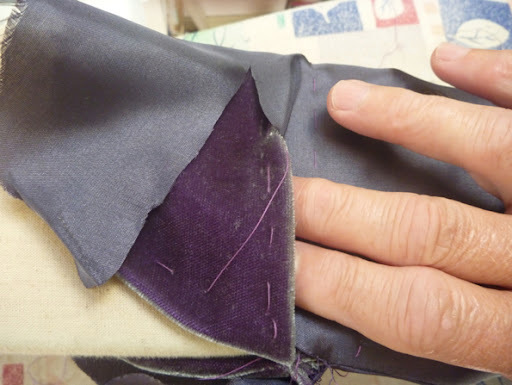 Work this stitch down the sleeve towards the cuff or the sleeve vent if your garment has one. This goes very quickly. Just be careful not to catch any of the fashion fabric with the stitches. Do the same on the undersleeve seam. Trust me, it's pretty intuitive what has to be stitched to what. Now for the fun part. 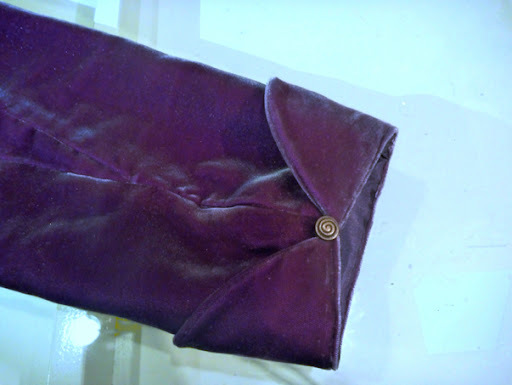 Reach down through the sleeve lining and grab the bottom of the sleeve. Then pull the sleeve up through the lining. Voila! A perfectly lined sleeve, turned inside out and ready to be worked on. 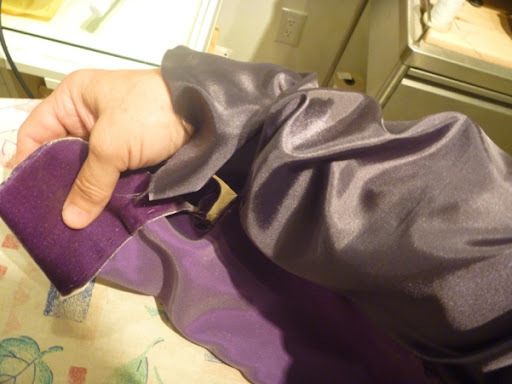 After smoothing everything out, I baste the lining to the sleeve close to the cuff to hold everything in place. A sleeve board is essential for this. 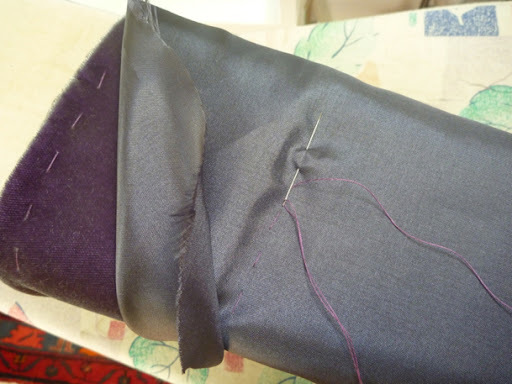 The excess lining fabric is then trimmed away leaving enough lining to tuck up under the cuff facing. Here you can see where I've basted the fold of the cuff. What you can't see is that the cuff has been interfaced with Prowoven Lightly Crisp sewn in interfacing from Fashion Sewing Supply. Great stuff! With everything basted into place, the cuff is edgestitched through all layers. I pulled out my cheap Brother free arm machine to make this easier. It struggles with thick fabrics, but I managed to coax it along. This would have been very difficult on my Singer 301. So here is the finished cuff turned back. I'm contemplating adding a small brass button for a little extra pizazz. Can a military style jacket have too many brass buttons? Next step.... Getting up the courage to cut into the coordinating brocade fabric. Can a military jacket have too many buttons? That's a trick question, right? Your jacket is coming along beautifully and thanks for the sleeve/lining tip. Oooooh. I love that little button there, it seems Meant. And I just keep wanting to stroke the screen, your velvet is so sumptuous! Thanks for the helpful pics. 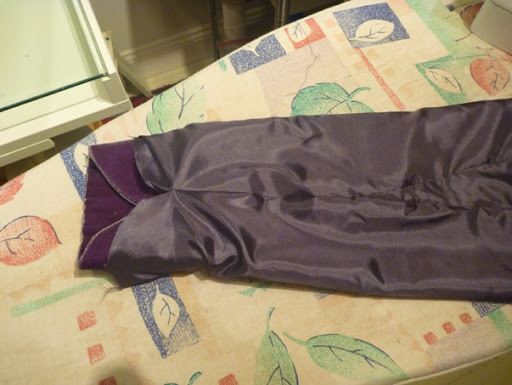 I really like those clever sewing tricks like bagging out the sleeve lining on woman's jackets, where you pull the sleeve through a gap left in a lining side seam. They have a kind of magical quality!